MONITORING OF CASES WITH A CHRONIC PERSISTENT INFECTION WITH HELICOBACTER PYLORI. Miglena Stamboliyska , Ivan Shalev, Diana Gancheva, Maria Atanasova, Violina Kaludova, Iskren Kotzev. Clinic of Gastroenterology, Department of Microbiology, Medical University - Varna, MHAT "St. Marina" Varna, Bulgaria. Introduction: The patients with persistent forms of Helicobacter pylori (HP) infection are refractory to eradication treatment. They receive unsuccessful therapies, experience frequent recurrences and re-infections. One of the main reasons for the development of persistent forms is an inadequate and insufficient treatment. The persistent forms of HP infection create conditions for the maintenance of activity and for the progression of the induced chronic gastritis. In this aspect these cases will be at a higher risk for the development of gastric cancer. The aim of this study is: to monitor and analyze the cases with persistent HP infection and to establish an approach for their management. Clinical material and methods: The study includes 12 patients (8 female and 4 male) at a middle age of 63,7, with a persistent HP infection, who have been observed for a period of five years. Two methods for the detection of HP infection are used – one invasive and one non-invasive. Upper endoscopy with morphological examination was performed. Results: In 9/12 patients HP was unsuccessfully treated for three times, in 2 patients – four times, and in 1 patient – five times. In all patients the initial treatment consisted of a standard triple therapy (STT). In 5 of them STT was conducted twice, with the same regimen for a period of seven days. Two patients received three courses of STT. In four patients an antibiotic resistance was established by means of a cultured assessment. In three cases an HP resistance to Clarithromycine and Metronidazole was demonstrated. Significant gastro-duodenal pathology with atrophic gastritis, intestinal metaplasia, and hyperplastic polyposis was found in all patients. The persistent clinical symptoms had 9 patients. Conclusion: We believe that a devised and proposed step strategy which covers early detection of infection, reliable diagnosis, adequate and successful treatment, and dispensary monitoring, contributes to the prevention of gastric cancer. Stamboliyska M, Shalev I, Gancheva D, Atanasova M, Kaludova V, Kotzev I. Monitoring of cases with a chronic persistent infection with helicobacter pylori. J of IMAB. 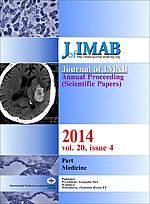 2014 Jul-Sep;20(4):523-525. http://dx.doi.org/10.5272/jimab.2014204.523.